I didn't intend to make Baby Bundt Cakes Friday. No, I had every intention of reading and running and doing anything but baking. 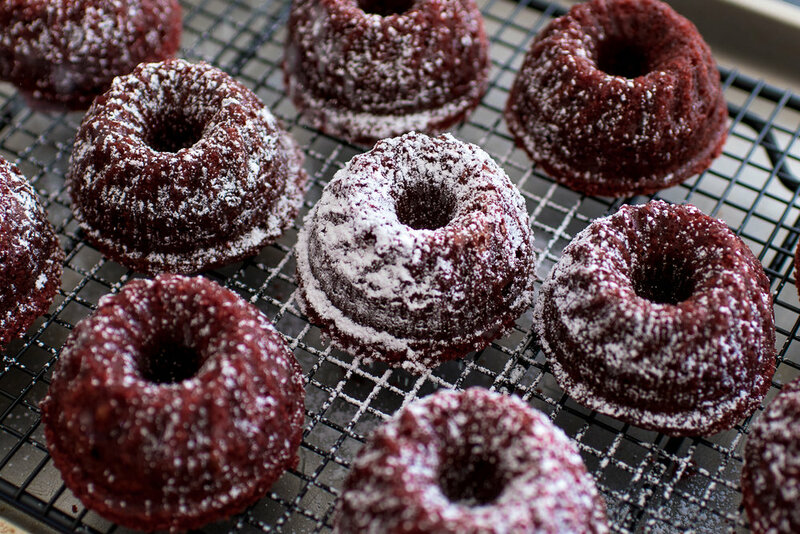 But then I was cruising Pinterest and came across this ridiculously easy Red Velvet Mini Bundt cake recipe . . . and I had the pan (thank you, Mrs. Santa!) . . . and all the ingredients . 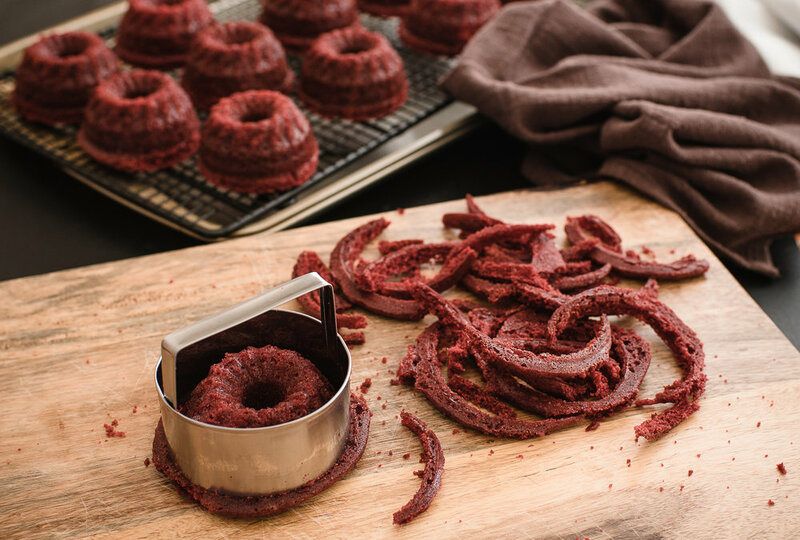 . . and I thought it would be a fun way to kick off the weekend. . . .
Four hours later, we had a dozen Red Velvet Baby Bundt Cakes cooling on the kitchen table as well as a mini cakelet (such a fun word to say!) cooling on the kitchen counter. And an upside down kitchen to prove it! See what I mean by my upside down kitchen? I began my adventures in bread baking this afternoon, making the first recipe in my "Bread Illustrated" cookbook, or what I call "Bread Baking For Dummies". It has step-by-step pictures to go along with all the recipes! I felt as though the authors were holding my hand through the whole process saying, "Okay, do this . . . now do that . . . here's how you knead . . . quit taking so many pictures and focus on the task at hand!" Okay, maybe they didn't really say that last sentence, but the instructions were written clearly and were easy to follow. The book is divided into three sections, easy, intermediate and hard, and the first recipe in the easy section happened to be Irish Soda Bread, and because I'm making chicken noodle soup tonight for supper, I thought that would be perfect to go along with it. So, I whisked and folded and kneaded and shaped and slashed the dough with a knife, baby talked the mound of dough as I put it in the hot oven, baby talked it some more halfway through when it was time to rotate the pan, and hey! I wound up with a loaf of Irish Soda Bread! Most of all, Joe likes it! Win-Win! This recipe is based on a recipe from the Amish, who were known for their simple and peaceful lifestyle; in fact, this is a very peaceful recipe to make as you only need a wooden spoon for the mixing (I wish I'd known about this when the kids were still taking their naps!). As the quote above says, this is an eggless cake and is really easy to make. I think it would make an excellent breakfast treat and I see myself baking this quite often in the future. Place a rack in the center of the oven, and preheat to 375 degrees. Lightly grease and flour an 8" square baking pan, and set aside. Place the soft butter and sugar in a large mixing bowl, and cream together with a wooden spoon until well combined. In a separate bowl, stir together the flour, baking powder, and salt. Add a third of the flour mixture to the creamed butter and sugar and stir to combine. Add half of the room-temperature milk, and stir to combine. Add another third of the flour mixture, stir, then the rest of the milk, stir, and then add the remaining flour mixture and stir just until moistened. Do not overbeat. Turn the batter into the prepared pan, and set aside. For the topping, combine the brown sugar and cinnamon in a small bowl, and stir to combine. Sprinkle this sugar mixture evenly over the top of the batter. Stick the butter slivers randomly through the topping and into the batter. Place the pan in the oven. Bake the cake until the center springs back when lightly pressed with a finger, 30-35 minutes. Serve warm. ~ ~ ~ from the cookbook, "American Cake" by Anne Byrn.